Digital music is here to stay, and these days, when it comes to music, specialty toy store owners are focusing on instruments and toys rather than CDs. 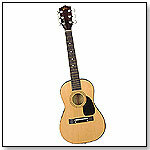 From guitars to harmonicas, there's an instrument for every store on the list below. Take a closer look and see which one will be the bandleader at your store this year. Pop! Pop! Piano™ by PATCH PRODUCTS INC. When children press a key on the piano, they not only hear a sound, they see stars pop up! The clear arch guides the popped stars onto a different pipe so when another note is played, they’ll pop some more! Adults can remove the arch to allow the stars to land on the floor, encouraging children to crawl after them. Pop! Pop! Piano measures 9" x 11" x 5.34" with clear arch attached. For ages 12 months and up. — Dean Smith, owner of JaZams in Princeton, N.J., told TDmonthly in a January 2015 survey that Pop Pop Piano is their store's best-selling musical toy. They sell around 10 each month. — Dean Smith, owner of JaZams Toys in Princeton, N.J., told TDmonthly in an April 2015 survey that the Pop-Pop Piano is their store's best-selling infant & toddler toy. They sell around 12 each month. — In a January 2015 survey, two out of 10 retailers told TDmonthly that Schylling Harmonicas were their store's best-selling music toys. 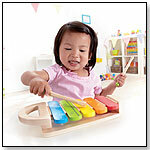 This high-quality wooden xylophone is designed with lifestyle colors, has a handle for easy toting and storage for two sticks. The baltic birch frame and maple keys and two sticks offer fun, safe early melodies. Robin Lehnert, Hape Marketing Manager, told TDmonthly, "A 10-month old begins with a rap and a tap. Who knows what could happen next on the very beginner xylophone." Launch date: February 2010. — In a January 2014 survey, Cariad Owens Fichtner, manager of Out of the Blue, Ltd in Albuquerque, N.M., told TDmonthly that Hape Xylophones were one of the top-2 best-selling musical toys at her store. — In a January 2015 survey, two out of 10 retailers told TDmonthly that Xylophones were their store's best-selling music toys. This 10-piece set of musical instruments (heavy on the percussion with maracas, a tambourine and a triangle) lets a child explore the wonders of sound, music, anthropology or just the fun of making some noise. ― Richard Gibson, owner of Learning Express of Newton, Mass., says his store sells about 6 or 7 of these sets per month. — Three of 45 retailers cited Band in a Box when asked about best-selling musical toys in mid 2007, citing sales of between three and 10 units per month. Seven of 48 retailers named it as a musical best seller in January 2010. Tuned to a C Major scale, the Chimalong is an 8-note metallophone that can be played by number, color or notes. The youngest children will use the included 15-song songbook to play by color; older children can play by number. As they progress, they'll learn to read the music and play by note. Additional songs are available on the Woodstock Chimes website. Packaged in a 4-color window box. Comes with 2-mallets, 15-song songbook and an extra #7 tube, which changes the B (for key of C) to B flat (for key of G), giving greater musical flexibility. Chimalong is "recommended for its educational value by many professional musicians, including John Sebastian, Marilyn Horne, André Watts, Peter Schickele and the late Jim Henson," Peggy Daniel, Web Development Director of Woodstock Chimes, told TDmonthly. The Chimalong has received the following awards: 2003 Parent's Choice Top 25 Toys in 25 Years; 1995 Oppenheim Toy Portfolio Classic Toy, Blue Chip Award; 1995 Oppenheim Toy Portfolio Best Toy Award, Platinum; 1995 Oppenheim Toy Portfolio Best Toy Award, Gold Seal; and 1987 Parent's Choice Gold Award. Launch date: 1986. ― Karen Park, owner of Zaks Gifts in Manchester-by-the-Sea, Mass., only recently began selling Chimalongs, she told TDmonthly in 4Q 2010; she sells about four per month. — Patti Tepper-Rasmussen, owner of Learning Tree Toys, Games & Books, Inc. in Oklahoma City, Ok., told TDmonthly in a January 2015 survey that the Woodstock Chimalong is their store's best-selling musical toy. — Taka Andrews, owner of Miller's in Mamoroneck, N.Y., told TDmonthly in a January 2015 survey that they sell a handful of Janod Guitars each month, making them the store's best-selling musical toy. Build a musical instrument with this 24-piece set. Includes 2 mouthpieces, 2 trumpet ends and twisting tubes. All components are made of unbreakable ABS plastic. Compatible with Tubation. — David Stelzer, owner of Shananigans Toy Store in Baltimore, Md., told TDmonthly in a January 2015 survey that the Saxoflute is one of their store's best-selling musical toys.